On the face of it the Antec TruePower Quattro 1200 should appeal to gamers and PC enthusiasts looking for a little more power than most It can deliver power to a full range of system components that include high-performance PCI Express graphics cards. In terms of total efficiency, the Antec TruePower Quattro 1200 gave a good performance, although, it was unable to touch the performance of the awesome Corsair Professional Series Gold AX1200. However, it lost significant ground in terms of standby efficiency, and was one of the worst in its range. Given this hit and miss affair it's disappointing that the PSU produced a high amount of decibel noise when compared to similar power supplies such as the Thermaltake Toughpower 1500W and the SilverStone Strider Plus, with it being the loudest under load. A good reason for this was the smaller 80mm fan, which has to work far harder to cool the system and strikes us as an odd design decision. Despite the fan being fairly small, it still managed to vent the excess heat, helping to keep the PC cooler on the inside than the exhaust, and the cables didn't significantly heat up during high loads. Throughout testing the Antec TruePower Quattro 1200 achieved 100 per cent of the manufacturer's claimed performance based on real-world scenarios and its 12 volt rails. The tested rails were also all within the ATX specified tolerances with the Antec TruePower Quattro 1200 producing an almost jitter free voltage reading at 75 per cent load, making a near flat line to showing less electrical interference. Mimicking an American muscle car, two red lines adorn the top of the Quattro's otherwise plain casing. The fan is mounted at the rear of the unit, whereas most of the other PSUs we've tested have had the fan mounted on the under belly of the unit, but generally the build quality of the Antec TruePower Quattro 1200 is quite tough. Size-wise, the unit is 210 x 86 x 150mm and is one of the biggest we've seen in this test it's also one of the heaviest weighing in at 3.202kg, so ensure there's plenty of room in your PC case to harness this brute. 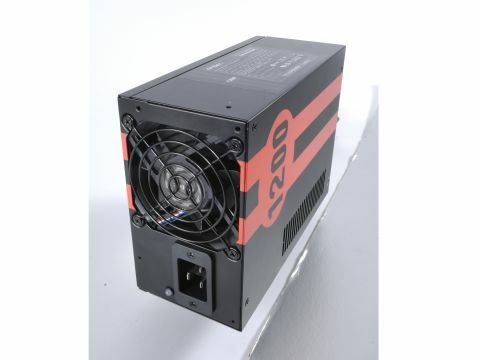 The manufacturers' stated AC power input is 100-240V 7-15A 60-50Hz and the Antec TruePower Quattro 1200 comes with a reasonable total of 33 output connectors; 1x ATX 24-pin connector, 1x EPS 8-pin connector, 1x CPU 4+4 -in connector, 4x PCI Express 6/8-pin connectors, 4x PCI Express 6-pin connectors, 11x SATA connectors, 9x 4-pin peripheral (MOLEX) connectors and 2x floppy connectors. The Antec produced a thoroughly average performance for this class of high-end PSU and it needs to improve its noise pollution and standby efficiency.